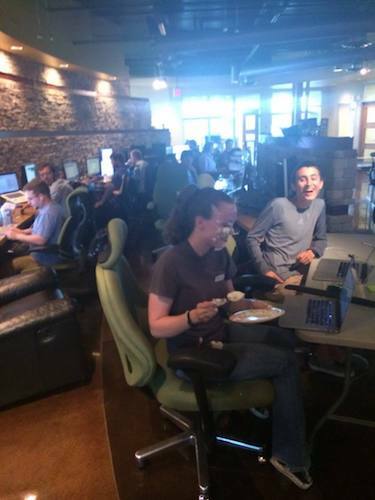 Between the end of high school and the start of college, I worked for a tech startup called Metova, a 3rd-party software dev company which makes iPhone and Android apps for other businesses (they have since expanded to many other areas). Metova had never had an intern before, so it was a tough sell. First I shadowed a developer for a day, to test the waters. They liked me and I liked them, so we negotiated. Thus, I got my first job that summer: a full-time unpaid internship helping develop iPhone apps. At Metova, I worked on a project called "Metova Creator". It is a web front-end which interfaces with a Ruby on Rails backend to speed up mobile app project development. Users can select common features they want in their Xcode project (e.g. code for taking a photo, a login screen, etc.—all of which was template Objective-C code I wrote), and based on these selections, a JSON is created. Then a Ruby script parses the JSON, generates an Xcode project, adds files to it, and posts to a new git repository. If you are looking for a good resource to learn iOS development, I would highly recommend Stanford's iTunes U courses titled "Developing iOS X Apps for iPhone and iPad" (replace X with whatever iOS version they're on these days). I took this course during the internship and found it extremely helpful.